WEST WINDSOR – The Mercer County Holocaust-Genocide Resource Center at Mercer County Community College (MCCC) will host a panel discussion offering diverse views and perspectives in recognition of the 150th Anniversary of the Emancipation Proclamation. The discussion, held in cooperation with MCCC, the African/American Student Organization (AASO), and the New Jersey Commission on Holocaust Education, will take place from 1 p.m. to 3 p.m. on Tuesday, Sept. 10 at the Holocaust Center, on MCCC’s West Windsor campus, 1200 Old Trenton Road. The Center is located on the second floor of the Library Building. The panel will examine the impact of the Emancipation Proclamation, from its historical significance to social and racial impact. Present and future impacts will be discussed, as well as problems remaining. 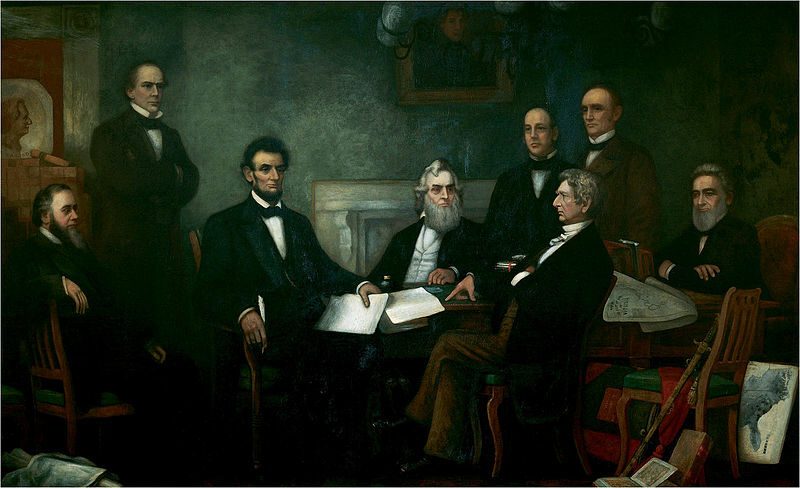 "First Reading of the Emancipation Proclamation of President Lincoln," by Francis Bicknell Carpenter, 1864. "We are going to address the Emancipation Proclamation from a variety of perspectives, and look at the idea of freedom – and lack of freedom," said Elizabeth DeGiorgio, co-director of the Holocaust-Genocide Resource Center. Panelists will include the Rev. Darrell Armstrong, pastor of Shiloh Baptist Church in Trenton; Dr. Diane Campbell, executive dean for Student Affairs at MCCC; MCCC History Professor Dr. Craig Coenen; MCCC Sociology Professor Dr. Joan Goldstein; and MCCC Bursar Lucia Brown Joseph, faculty advisor for the AASO. The presentation is free and open to the public, and especially appropriate for educators, students and those with an interest in world-shaping events. Professional development hours are available for educators. Educators should register by visiting http://education.state.nj.us/events. For more information, email mcholgen@gmail.com. Learn more about the Holocaust-Genocide Research Center and upcoming events at www.mccc.edu/holocaust.